......To the Madison County Historical Society. MCHS was organized in 1884 and incorporated in 1926. 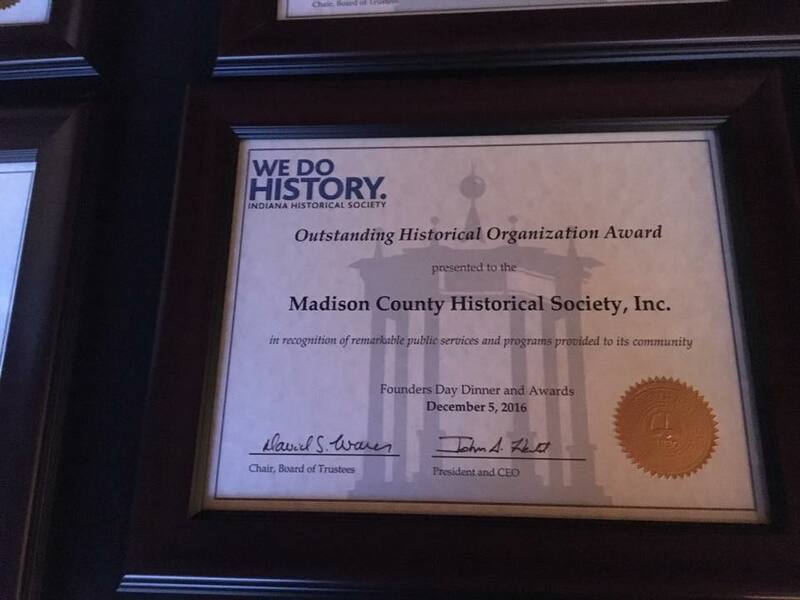 From these humble and early beginnings, the Society has continued through the years with vigor, energy, and dedication on its mission to collect and preserve objects, artifacts, documents, and photographs pertaining to the history of Madison County, Indiana. Through research, education, and exhibition, we seek to interpret and prompt an awareness and appreciation for that history for the benefit of all generations. At our home in downtown Anderson, there is a lasting record of a way of life preserved for all to see, treasure and enjoy. We welcome all who are interested in exploring our rich culture and social history. The earliest pioneers, seeking new homes and better farm land, came here when there were only Indian trails and buffalo tracks. They settled along the White River and small creeks in Madison County, encountering the Indians, clearing the timber and stayed because of the richness of the soil and the promise of prosperity. Indiana was the cross roads to lands further west and many did pass through; however, those who remained, built homes, farms, businesses, churches, and communities. Our early history is interwoven with that of the Delaware Indians and those early pioneers who came to a new land. Their lives and courage should give us pause and inspiration to continue with the work we have set for ourselves and the Society. "On behalf of the Madison County Historical Society, we would like to thank all who donated and the public for their contribution in helping make the Country Rummage Sale a success. 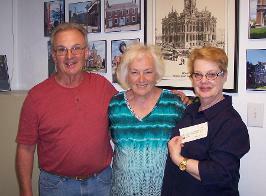 We were able to raise $3,012.25 which will help with the many projects the Society has going at this time." Ron and Wilma Carey; Melody Hull, MCHS Pres. The Madison County Historical Society is sponsoring an exhibit about the Great World War. With the rest of the world, MCHS will be marking the centennial celebration of the end of World War I. This exhibit will be open for the rest of the year. The exhibit hall will showcase the county's soldiers, sailors, aviators, and medical professionals who participated in this first global conflict. Various local WW I collectors have loaned us their military artifacts to make the exhibit more complete and multi-dimensional. We are excited to be a part of an international commemoration of this modern day conflict. The display committee has designed an exhibit that is historically accurate along with showcasing fine and rare items. There are artifacts and items including many era posters and advertisements. Also included is an Honor Roll with many of the soldiers from Madison County, rifles and ammunition, and flags. 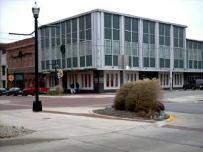 The exhibit will be open on Mondays, Wednesdays, and Fridays from 10:00 a.m. to 3:30 p.m. at the History Center, 7 West 11th Street, Anderson, Indiana. A BIG "THANK YOU" to Bill Knepp, Linda Jones, and Melody Hull for their hard work in bringing this exhibit to fruition. If you wish to bring a group for a tour or need a special time or date, please call 765-683-0052 and make arrangements. There is no fee for this activity. 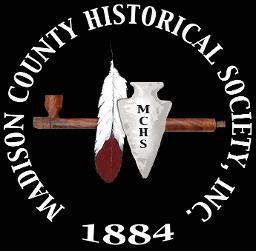 On May 9, 2018, MCHS received a letter from the Madison County Community Foundation, Inc. that they had given us a$5,000 grant for the development of our "Museum Room Project". Thank you so much. Stephen T. Jackson, Madison County Historian, has embarked upon a new history series that will be published in the Herald Bulletin. Please be looking for these articles about our county. The series is titled "What's in a Name?" Steve brings to light the early organizing of the county, the people and interesting place names like Toad, Hardscrabble and Buzzardville. You can follow the link here for the first two articles. For those of you who missed Steve's "Fall Creek Township" live presentation at the Museum, you can go here. "If the River Could Talk"
Throughout Indiana's Bicentennial year of 2016, Stephen T. Jackson, Madison County Historian, authored a series of articles called "If the River Could Talk." Those articles appeared in The Herald Bulletin on the History Page. The Herald Bulletin and Steve Jackson have once again teamed up. This time to bring to the community a new book called "If the River Could Talk". The book is now available at The Herald Bulletin. You can obtain a copy(s) of the book by calling The Herald Bulletin at 765-640-4848 and picking it up at the office. Those of you wishing to have a copy(s) sent to you may do so by sending your name, address, phone number and check or money order to The Herald Bulletin, 1133 Jackson Street, Anderson, IN 46016. You may also call THB at 765-640-4848 to order with a debit/credit card. The book is priced - at publication - at $29.95. There is a $6.05 shipping fee for mail order. The Madison County Historical Society will benefit from the sale of this book. This is a wonderful and thoughtful way for you to support the Society and gain a tremendous value for yourself. Remember, Christmas and birthday gifts of books are very much appreciated! Order NOW! Please support Steve Jackson and The Herald Bulletin in their efforts in bringing the story of our heritage to everyone in the county. Join us with a membership in our Society. Everyone any where is welcome to join; you can be in county, state, or out-of-state. Do it today! Do you have a special talent or interested in a special project? How about spending a few hours during the week helping us? 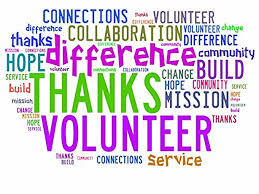 Your volunteer work can be rewarding.....come join in. 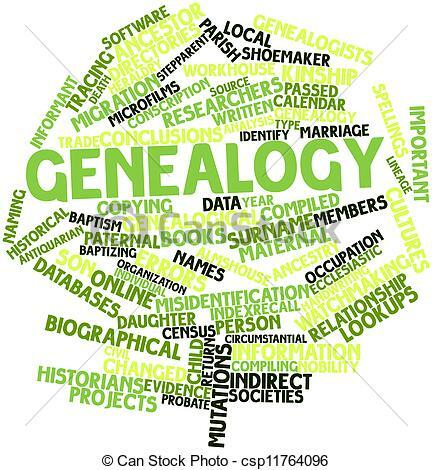 If you are looking for an ancestor in Madison County, we are the place to help you discover what happened to them, where they were in the county, what they did, and how they got here. Send us a query and we will try to help. You may also update your email address here. Sign up for our eNewsletter and keep up to-date with all the History Center activities and events. You will receive an email about once a month that includes stories, activities, and news. Don't miss anything.....sign up today! Control what you can, cope with what you can't, and concentrate on what counts. It is not just History, it's an adventure. SIGN UP TODAY!